I have a confession to make. I have an emotional raincoat. It’s invisible so you can’t see it. I can’t see it either but I can feel it. Despite being invisible, it’s my best accessory. In my mind’s eye, I imagine it to be bright and light and the colour of sunshine. Bet you think I sound like a total fruit cake, right? Only with added nuts. My emotional raincoat is the ultimate sensory protection. You see, I’m a bit of a lightweight where heavy stuff is concerned. Sometimes I think my insides are like a chocolate cookie. When everything’s good, that’s just grand but when times are tough. Not so much. When the heat is on, and there’s stuff going down, I either melt or just crumble. If I allowed myself to soak up all the bad stuff, my heart would be so heavy, I simply wouldn’t be able to function. You see, a lot of the time, all the bad stuff whether it be global, national, work related, personal or anything inbetween, is out of my control, there’s nothing I can do to change or improve the situation, because if I could, I would. And if I can, I do. I had to wear my raincoat all day today. As soon as I heard the MH17 news my insides were in knots. The thought of it was just too difficult to bear. So I didn’t bear it. I put my emotional raincoat on and tried not to watch the news. As a rule, I try my hardest not to watch the news. Ever. Not because I am consciously choosing to be ignorant, more that I’m consciously choosing to be happy. There is so much bad stuff happening out there, if I fill up my head and my heart with all the bad stuff, then how am I going to make room for the good? Call me naive or cray cray if you like. but I call it self preservation because sometimes there is just to much bad stuff out there for me to handle. It’s not that it stops bad stuff happening. It just helps me deal with it better. Weird as it sounds, I imagine myself in the bright yellow raincoat with all the bad bouncing like raindrops onto my coat and then bouncing right off. Sometimes it feels like gentle dewy drops and sometimes it feels as heavy as hailstones, but my coat always keeps me calm on the inside. You might think that me wearing my coat makes me no different from the kid that sticks their finger in their ears and hollers tra-la-la at the top of their voice. Except that by wearing my coat, I acknowledge the negative, but I am making a conscious decision to remember the good. You gotta remember the good. Because otherwise what’s the point? Fashions come and go but my emotional raincoat will never go out of style. As Maya Angelou said “if you don’t like something, change it. If you can’t change it, change your attitude.” I don’t like all the bad stuff. But I can’t stop it happening. I wish I could. I can’t always change what happens in my life, in my town, in my country, in the world. I can’t be responsible for everyone and everything. But when I’m wearing my raincoat, I can change my attitude. And when I do that, I can be the change that I want to see in the world. 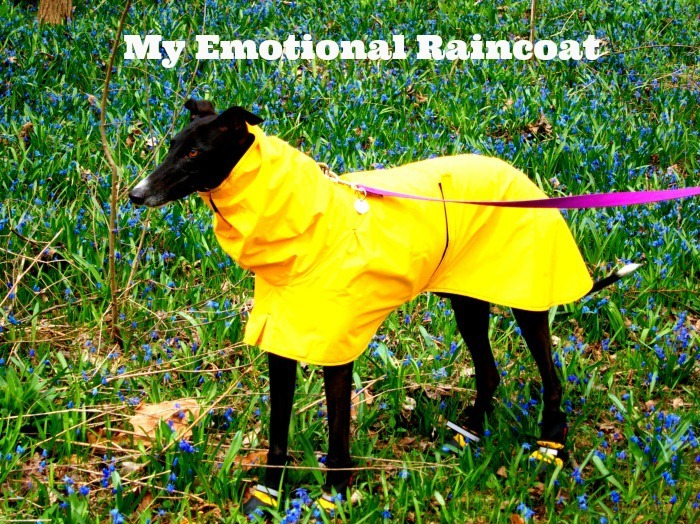 Have you got an emotional raincoat? What’s your best form of self-preservation?